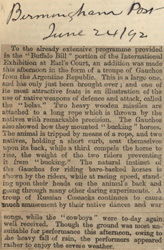 To the already extensive programme provided in the "Buffalo Bill" portion of the International Exhibition at Earl's Court, an addition was made this afternoon in the form of a troupe of Gauchos from the Argentine Republic. This is a large one, and has only just been brought over; and one of its most attractive feats is an illustration of the use of native weapons of defence and attack, called the "bolas." Two heavy wooden missiles are attached to a long rope which is thrown by the natives with remarkable precision. 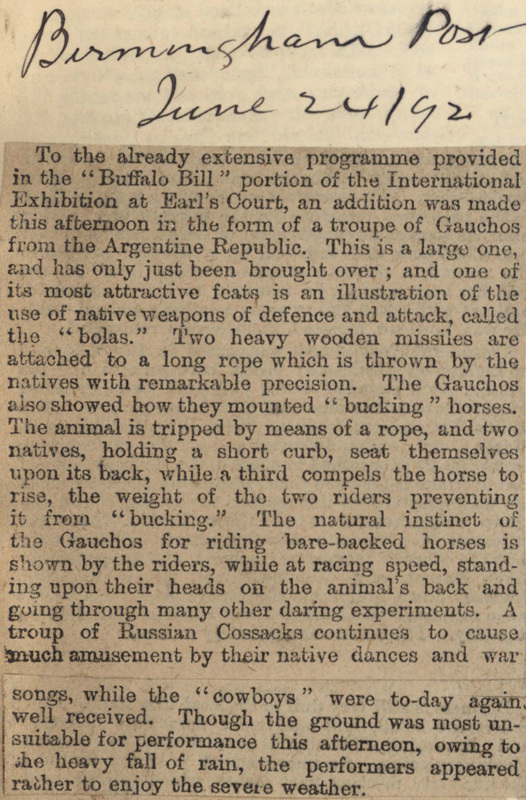 The Guachos also showed how they mounted "bucking" horses. The animal is tripped by means of a rope, and two natives, holding a short curb, seat themselves upon its back, while a third compels the horse to rise, the weight of the two riders preventing it from "bucking." The natural instinct of the Gauchos for riding bare-backed horses is shown by the riders, while at racing speed, standing upon their heads on the animal's back and going through many other daring experiments. A troup of Russian Cossacks continues to cause much amusement by their native dances and war songs, while the "cowboys" were to-day again well received. Though the ground was most unsuitable for performance this afterneon, owing to the heavy fall of rain, the performers appeared rather to enjoy the severe weather.